Bio: Capt. Tony Janik has spent most of his life in or around the water surrounding Northeast Florida. He has pursued various interests including surfing, skateboarding and mountain biking, but has been drawn to the water and more specifically, the pursuit of fish since he was a child. What began as curiosity and hands deep in a bucket of baitfish quickly developed into a lifelong passion. Capt. Tony Specializes in shallow water redfish. With his experience, you will be guided to conditions that are favorable for stalking and sight fishing redfish in low and flood tidal conditions. Depending on the time year and the behavior of the fish, you will be put into casting position and exposed to heart pumping redfish activity such as waking, backing, feeding and the infamous-tailing. Capt. Tony is also an avid fly tyer, this coupled with his knowledge of the local fishery will have you throwing true and tried patterns that catch fish. Capt. Tony’s personality can be characterized as a good balance of patience and enthusiasm which enables him to comfortably provide guidance as needed to anglers, no matter their skill set. When off the water, Capt. Tony is found enjoying time with his beautiful wife, three children and their chocolate lab (and tying flies). Bio: Capt. Jacob Benton has fished the waters of Northeast Florida for over 15 years. He received his first fly rod at the age of 10, and has been passionate about the sport ever since. Over the last few years, he has focused exclusively on learning the art of shallow water fly-fishing. These days, he enjoys poling those on the bow of his boat just as much as catching fish himself. In addition to guiding on his home waters, he fishes the waters in the upper and lower Florida Keys as well as Louisiana multiple times/ year. When he's not working or fishing, Jacob enjoys hanging out with his wife Alison, their daughter Amelia and their two labrador retrievers, Isla and Dixon. Favorite place to fish: Anywhere with water and fish that will readily take a fly... Islamorada and the lower keys would be on the short list, as would the alpine lakes of Colorado. But at the end of the day, its hard to beat chasing fish alongside great company in Northeast Florida. 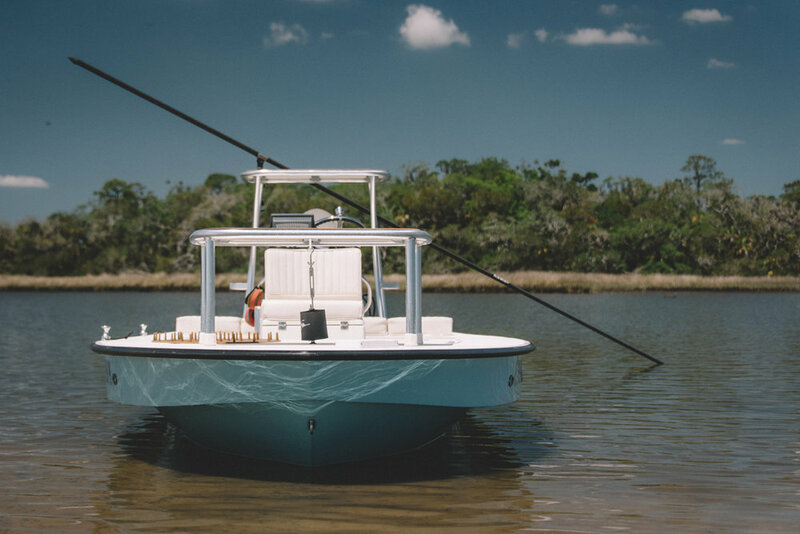 Perhaps East Cape's most versatile hull, the Fury excels in the shallow waters of North East Florida. This skiff is equally as capable poling down wintertime low tide creeks as it is chasing beach run tarpon. Maverick's shallowest draft technical poling skiff gets anglers into the skinniest water while keeping them comfortable and dry.